The compact R-101 is designed to hold a DSLR body with lens attached plus accessories. 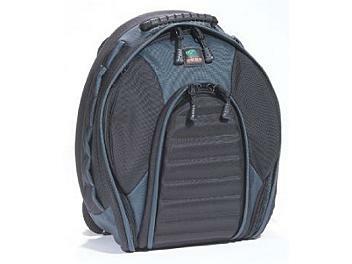 The rear padded compartment will hold a netbook/small laptop (up to 12") or additional accessories. The special design gives quick, separate access to the camera in the central compartment, while the rest of the equipment surrounding it remains secure. Additional accessories, like flash-unit, filters, charger, cables and personal essentials can be stored in the spacious arched lid compartment, the 2 external pockets and the central mesh pocket.